The UK's banking sector is growing at its fastest rate since before the financial crisis, a new industry-wide survey suggests. More than a third of UK banks increased their business volumes over the last three months compared with just 9% who saw volumes fall. That shows the strongest growth in the banking sector since June 2007. The research was conducted by the CBI and the accountants PricewaterhouseCoopers. Overall profitability of the banking sector also increased for the fifth quarter in a row. 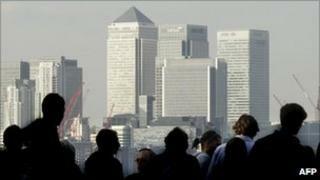 Several major UK banks have reported big increases in profits so far this year. HSBC saw its profit for the first half of the year double to £7bn, while Barclays saw its profits for the first six months rise 44% to nearly £4bn. But commenting on the results of the survey, the CBI's chief economic adviser Ian McCafferty said that despite continued profit rises, the growth in the banking sector was still slower than he had hoped for. Looking forward, he said that new banking regulations and low economic growth could hurt the industry. "There is ongoing concern that prospective regulation may hold back business expansion in the coming year," he said. "But financial services firms have become more worried that weak levels of demand will dampen growth prospects." Andrew Gray, UK banking leader at PricewaterhouseCoopers, agreed that the performance of the wider UK economy was a concern. "While the banks are broadly in good shape, business is still constrained by the economic environment." According to forecasts from the Office for Budget Responsibility (OBR), the UK is expected to grow by 1.2% this year and 2.3% in 2011.